I haven’t fished for over a week, a combination of work and play to blame, but I finally got home in time this evening to get a couple of hours on the water. 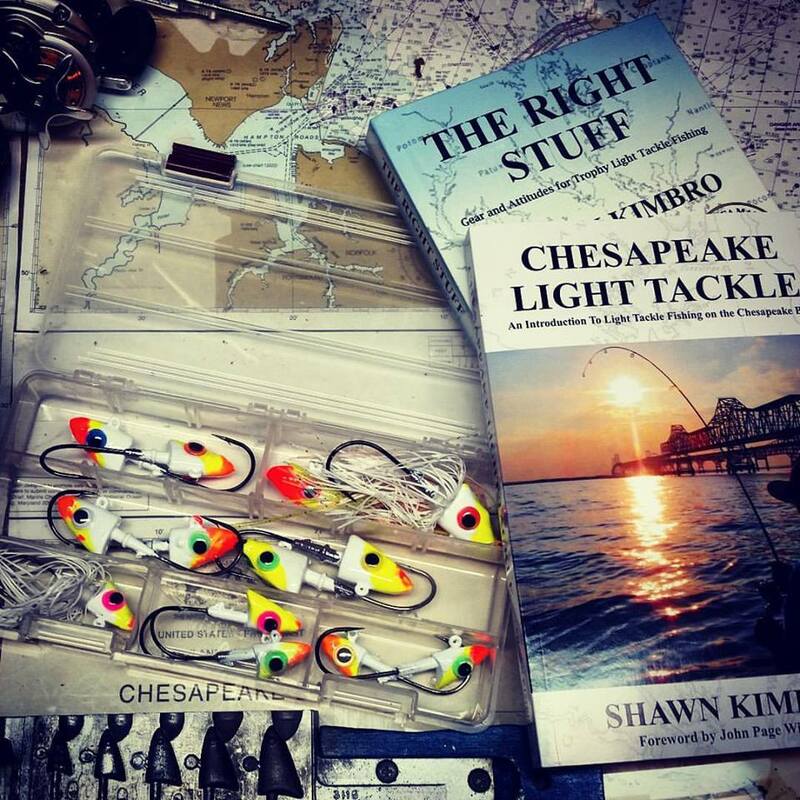 Even though I had very good reports of breaking rock and blues to the south of Kent Island, I decided to launch at Matapeake and fish the Bay Bridge. There’s just something about jigging the bridge that I find very attractive. I guess mostly it’s the chance for an occasional bigger fish. The bridge can be a fickle mistress however, and although I haven’t been skunked there in 2009, she often disappoints me with only shorts. I cleared the fishing peer about 6:45 PM. Pointing Crockett’s Reel toward the bridge, I looked up to see breaking bluefish over the 8′ oyster bar just south of Bay Bridge Marina. I had anticipated the temptation and already decided not to stop. Tonight’s objective was quality, not quantity. 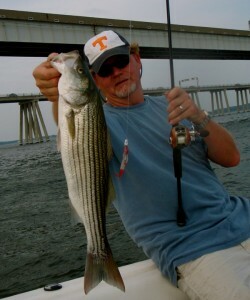 My usual strategy in fishing the bridge is to start with a couple of pilings that I know to have produced well in the past, then work east or west depending on whatever pattern I can identify based on those hot spots. I was disappointed to find very little current when I started fishing. Even though it’s a full moon, the incoming tide was against what had been a relatively strong northwest wind, so there wasn’t much northerly flow. 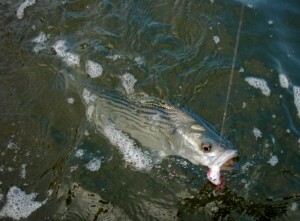 I tied on a 6″ Strike King Zulu soft plastic bait dipped in red Spike-It dye and a one ounce jig head and went to work. The fish were there. I can’t say it was by any means a wide-open bite, but it was steady. Since air temperatures were very warm when I started, all my fish stayed in the water tonight except for two I kept. 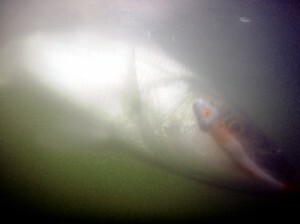 Recent research has shown that fish have a difficult time surviving at temperatures over 90 degrees. It isn’t hard to keep them in the water. I just reach down and unhook them beside the boat so they never really feel the heat of the day. I worked my way across the bridge spending a little more time at the rockpiles than usual since I’ve received several reports of good bites there. When I got to the western shore rockpile there were three or four boats anchored up and fishing. I guess I’m not the only one who heard there had been a good bite there. Fortunately for me, they were all on the wrong side! 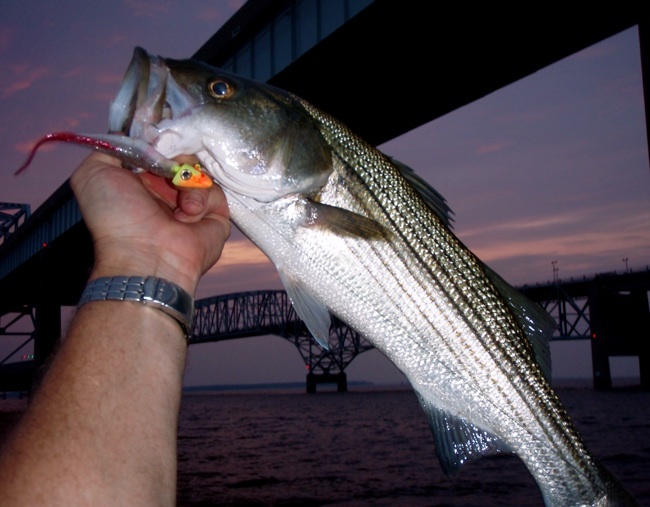 Unless fish are real ly on at the Bay Bridge rockpiles, it’s very difficult to catch them unless you work the up-current channel-side corners. When they’re there, they are usually holding in a space about the size of a pickup truck bed. I motored over the opposite corner and marked a few fish on the sonar. Compensating slightly for the light current, I made a 25 yard cast upstream from where I saw the fish allowing the lure to drift with the current and touch bottom right where they were holding. Wham, a 24 incher on the first cast followed immediately by another one which was a little bigger. I got a couple of dirty looks from the guys in the other boats as they hastily pulled anchor and headed toward me. I decided I didn’t want to fish in a crowd, so moved on. I couldn’t find many keeper-sized rockfish on the west side, so I moved back over the the east and started reworking the same spots where I had started. Almost all the fish I caught were keepers tonight with enough mid-20s to keep things interested. I had a couple in the 26 to 27 inch range which isn’t bad for August jigging. I was surprised that I didn’t catch a single bluefish tonight although I could feel a few pecks now and then that were most certainly blues. 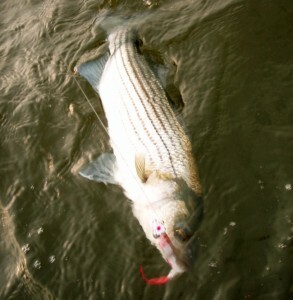 I threw top-water at sunset over the Sewer Pipe, but only had one blow-up and it was a smaller fish. I moved back to the bridge just before dark and finished the evening with a very pretty fish. Sounds like the fish are there for the taking. Thanks for the report. Nice report. I’m gonna have to get out with you again and learn how to fish that bridge. Thanks for sharing.